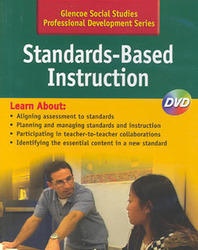 Standards-Based Instruction—Learn about aligning assessment to standards, planning and managing standards and instruction, participating in teacher-to-teacher collaborations, and identifying the essential content in a new standard. Participants learn about the power of standards-based instruction. They watch video commentary by teacher educator Emily Schell, Ph.D. who discusses the role of standards-based instruction in classrooms today. Participants observe a social studies department meeting in which teachers discuss the standards their students are required to master.